Specializing in men and boys' hair cuts, barber shops are far more than just another type of hair salon. With a rich history and a nostalgic place in Americana, they are a great option for specialty cuts and other services. Barbers are an ancient set of professionals: barbering services were offered in ancient Greece, Egypt, and Rome. Initially, barbers provided just hair and shaving services, but eventually they became minor surgeons and dentists as well, often extracting teeth, lancing boils, and letting blood to treat all manner of ailments. In the mid-1400s, however, as medicine began to advance into more specialized procedures, barbers withdrew from the medical services and focused on providing meticulous care of men's hair, including shaving, which was often required for religious or hygienic reasons as well as for style and status. 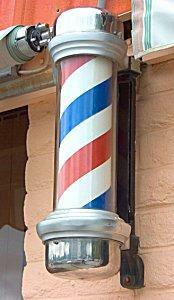 The classic red-and-white striped barber pole was originally a symbol related to barbers' surgical services. The accepted theory is that the origin stems from bandages - white sterile ones and red used ones - that would be laundered and when the wind blew, would twist around one another, creating the signature stripes. Over time, poles were used as more visible and reliable signage. In the United States, the blue stripes were introduced to demonstrate patriotism, and today poles can even be found with stars to emphasize that symbolism. Today there are more than 30,000 barber shops in the world, though that number is significantly lower than decades past as more men turn to full-service hair and beauty salons for specialized treatments. The modern barber shop is likely to offer a greater range of services, use more modern equipment, and may even employ female stylists, though the basic emphasis on men's services has not wavered. Ear and nose hair trims, a non-existent service in other types of salons. Consultations about hair loss and potential remedies. Beard and moustache trims, including different styles. Facial shaves with traditional straight razors and hot lather. Basic coloring treatments, most frequently to cover gray hair. Scalp and neck massages to promote relaxation and stimulate hair growth. Sales of men's hair care products such as aftershave, shaving cream, and specialized shampoos and conditioners. At the same time, the idea of what a standard hair cut is has drastically changed. While barbers once had a limited range of hair styles to offer due to the rigid expectations for a men's cut, today there is great variety in both style and lengths of men's cuts, and most barbers can accommodate a wide range of looks. Unlike full-scale hair salons that offer perms, radical color changes, hair extensions, or other intense treatments, barber shops more frequently focus on simple but time-tested techniques. By definition, women's styles such as updos and sedu styles are not administered by barbers, though women who prefer simple, straightforward cuts can often find better prices and efficient service by visiting a barber rather than a more elaborate stylist. The barber shop experience is one of camaraderie, nostalgia, and companionship. Over time, shops develop a steady and dedicated patronage of loyal customers who gather for trims and cuts while exchanging news, gossip, and the occasional card game. A father often brings his son to his barber for a first hair cut as a rite of passage, and a personal barber becomes a valued confidant and friend. While the relaxed yet efficient atmosphere may not fit well with today's fast-paced society, it is still one that is welcomed in many neighborhoods and barber poles will continue to be a familiar landmark for years to come.